In March, the Psi hosted the third annual Alumni Traditions Workshop, inviting alums back to the hill to revive and celebrate old traditions. Headlining the event was the Psi Archive Display Case Project, spearheaded by Aaron Cannon ’18 and Mark Sperry ‘17. 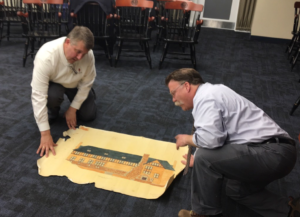 The project is the result of a yearlong effort to collect historic Psi artifacts and display them in a memorabilia case constructed within the foyer of the old chapter house. Special thanks to Jim Lent ’83 who donated this historic rendering, and Tom Porter ’80 for participating in Skype discussion with the Psi.